Welcome back! To re-set the scene, four friends left the glitter and oversized headwear of Garden Beats (the “Coachella of Singapore”) and arrived at La Maison du Whisky with a dream. That dream was to explore the range of bottlings which separated this French brand from the pack. The first two drams in the tasting, the focus of the first instalment of this piece, were a roaring success. So, now I’m faced with a problem – how can I follow-up such an outrageous duo? Well, Singapore knows how to do international, so we figured this part of the tasting should match up. 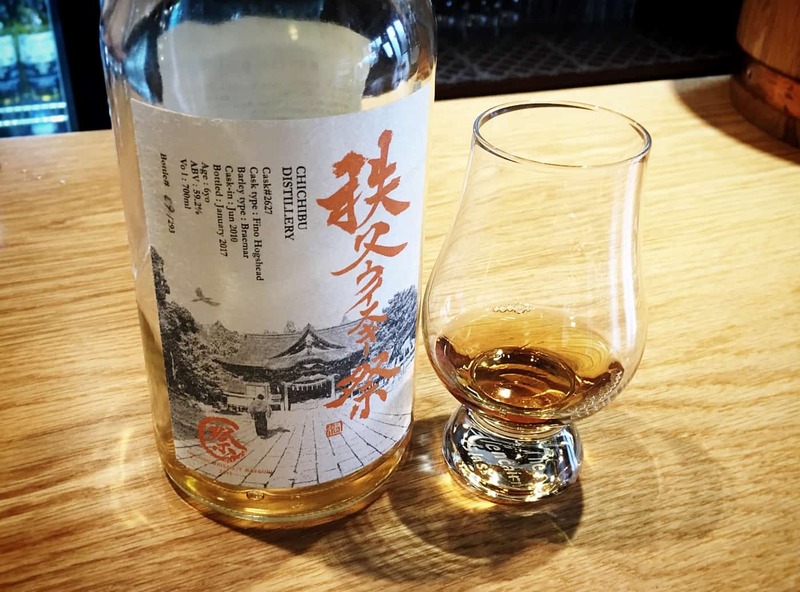 The selected bottles covered four distilleries from four different countries – what, in LMdW’s opinion, are some of the best that Japan, Taiwan, India and America have to offer. First up, the Chichibu Paris Edition. A combination of three Mizunara oak and two new French oak casks. Following my review of the London Edition, there was a lot to look forward to in reviewing the second of the releases (the hunt for a sample of the Chichibu US Edition, continues). Second, the Kavalan Brandy Cask four-year-old. A brandy cask is always intriguing and is still not commonly used these days. A younger bottling, it was between this and the Virgin Oak 11-year-old. I have tried virgin oak Kavalan before, so it was time for something different. Third, the Amrut special edition. A 6-year-old matured in an ex-bourbon cask. On the face of it, bottled at 60% and such a dark colour from a bourbon cask, hopefully, I was warranted in looking forward to this. Finally, the Blanton’s. Bottled as part of The Chronicles 2018. I have tracked this bottle and only seen the grossly inflated price at auction. So, this bottle, in its rarely seen open state, was a must-have to close out the tasting (and were a lovely foil to the Scottish distilleries in the first round of tastings). A patio in Singapore was the last place I would have expected to try all these bottlings. But, here we are. A selection that would give any hawker centre a run for its money. Let’s see what these bring to the table. On the nose: Very malty on the nose. Cereal and oatmeal drizzled in honey. Some more classic bourbon scents – caramel and vanilla. Some barley arrives as well. We move on to freshly baked sourdough bread, heavily buttered. Light white fruit that only really opens up towards the end alongside a bit of spice. In the mouth: There is the sourdough again but baked in are a variety of flavours – earthy notes complemented by pepper, lemon zest and anise, all with that salted butter spread. Soft tropical fruit notes follow on – white peaches, grapefruits and apricots (a softness that is more pleasant and less acidic than expected). Some ginger and cinnamon add an extra bit of spice here, which draws attention away from the rest of the flavours. A long finish that brings out more of the spices, oak and earthy flavours. On the nose: Very fruit-forward on the nose – strawberries, blackberries and currants strike me immediately. Light vanilla and honey are slightly behind, together with soft floral notes. A bit of spice as well. An interesting mix. In the mouth: A nice start, the fruits and honey complement the nose. This moves on to cherry cough drops and elderberries. A very clean flavour comes through alongside the brandy notes but again this is not particularly strong and does not work well with the rest of the dram. The combination of these flavours gives this a tangy finish, but it lacks texture and is quite short. On the nose: Soft flavours that build up slowly. This starts off with nice fruit flavours – an interesting combination of nectarines, raspberries. Some malt and barley appear, which are supplemented by a bouquet of floral notes – Spring has arrived! In the mouth: The honey and apple work well here – a nice combination that has elements of a perfectly baked apple crumble. Pears, currants, strawberries, raspberries, apricots and peaches also appear alongside giving this a wealth of fruit flavours. Despite the high ABV, the spirit is not strong, and the subtlety of the flavours rise as one. The finish shows the spice of cardamom, ginger and pepper working together with a light hint of oak to balance this out. On the nose: Starting off with Manuka honey notes, this moves on to ripe dark fruits (blackberries and blueberries). This transitions into lighter, tropical fruits such as pineapples and pomelo. There are hints of liquorice subtly throughout that mix in the smell of pure cacao and salt. In the mouth: Overall, the texture and flavour is a bit thin – as each of these notes came forward I felt like I was grasping to try to make sense of the dram. The sweetness has turned in one direction, that heavy cacao from the nose. Though the elements of fruit remain in the flavour (apples, pears, peaches and melon), these are more of a marmalade than ripe fruit. The liquorice also sits in the flavour but has a bit more presence in the mouth. The honey almost disappears and in its place a few spices arrive – cinnamon, ginger, nutmeg. The finish is medium and with the oak provides an interesting twist on what I would have expected from the rest of the dram. A lot of information to take in there. I think my liver felt the same. These were all such unique flavours that even writing this a week later, I am still in shock that I was able to fit this into one tasting and two articles. The Chichibu managed to separate itself from the rest of the drams (and the London Edition). The nose was lovely, and the flavours were rich and interesting. The spice added a bit of complexity but at times overpowered parts of the dram that I looked to have more of a role in the spectrum of notes. I am probably being picky, but it still did have a bit of work to do to really elevate it to an excellent bottle of whisky. The Amrut was rich but lacked the complexity for it to really stand out. Given the limited time for this whisky to mature, it will make it more difficult to achieve that variety of flavours. This brings us to the Kavalan and the Blanton’s. Neither of these really took my breath away. Where the Kavalan succeeded was the actual flavour profile – some nice notes came out of this whisky. However, it lacked the depth to really make it anything special. Meanwhile, the Blanton’s brought out the spirit’s profile and some interesting cask flavours made very brief appearances, but it did not achieve much more. With each sip I demanded more of this liquid for these flavours to really shine through, they needed to be fuller, richer and work together rather than jut out independently from one another. The group saw the delight in my eyes. Many whisky bars in London will have access to any number of bottlings, outside of the La Maison du Whisky name. This Singapore bar still managed to outperform on selection. Yes, these four whiskies did not take my breath away. But the experience was unforgettable! Singapore, it’s been a trip! Photographs from La Maison Due Whisky. Amrut in the past, and enjoyed it. Wish I could say your review of Blanton’s was inaccurate, but since I haven’t enjoyed that particular barrel, I cannot. I look forward to trying it one day myself! Thanks, Abby! Sorry for the late reply. I’m hoping to snag another Blanton’s from LMdW at some point so I can do a compare and contrast to my notes on this one. Amrut has had my interest since the Spectrum 004 and I haven’t looked back. Definitely keep letting me know your thoughts – always keen for the others’ opinions (especially if they recommend something to try in addition). Happy Monday!